Online classifieds major, Quikr today announced the launch of Dazzlr, a talent discovery platform that aims at bringing together actors, casting professionals, directors and producers. The platform has been developed by Quikr in partnership with Vivek Bohra, a filmmaker and casting director, Aadore Mukherjee. It claims to offer tailored solutions to cater to the needs of both artists and casting professionals for a variety of entertainment formats such as cinema, television, theatre, advertising, regional and international film production. According to an official statement, the Indian media and entertainment sector alone is expected to be worth $29.11 Bn by 2019. Dazzlr allows actors to list themselves for free, but there’s a fee to apply for selected roles. The platform enables production houses and casting directors to post their requirements and browse through artist portfolios to bookmark and call them for auditions. Its features for artists include provisions for video and image uploads to build a portfolio and notifications to help them stay updated on opportunities in upcoming screen roles. Based in Mumbai, Dazzlr will currently operate as an independent entity under the Quikr umbrella. Vivek Bohra, co-founder, Dazzlr, said, “This is just a first step in Dazzlr’s journey to help organise the unorganised segments of the entertainment industry. We have worked closely with the product and technology teams at Quikr to ensure that Dazzlr caters to the unique needs of our peers in the film industry. While we begin with getting ease and transparency to casting and discoverability for industry professionals, we are sure that the road ahead is going to see many more divisions of the entertainment industry becoming more transparent and organised”. Founded by Pranay Chulet in 2008, Quikr claims to have a userbase of over 30 Mn per month. It is present in 1000 cities in India and operates across several classifieds businesses including c2c, cars, education, homes, jobs and services. It operates in 14 categories that include mobile phones, household goods, cars, real estate, jobs, services and education. It is backed by investors including Tiger Global Management, Kinnevik, Warburg Pincus, Matrix Partners India, Norwest Venture Partners, Nokia Growth Partners, Steadview Capital, Omidyar Network and Ebay Inc. In January 2016, Quikr acquired online realty portal CommonFloor in a stock-and-cash deal for $200 Mn. Following that, in March, it launched Quikr Doorstep to revolutionise consumer-to-consumer buying and selling in India. In July, Quikr acquired Bengaluru-based online recruitment firm Hiree, that focussed on white collar jobs, for an undisclosed amount. 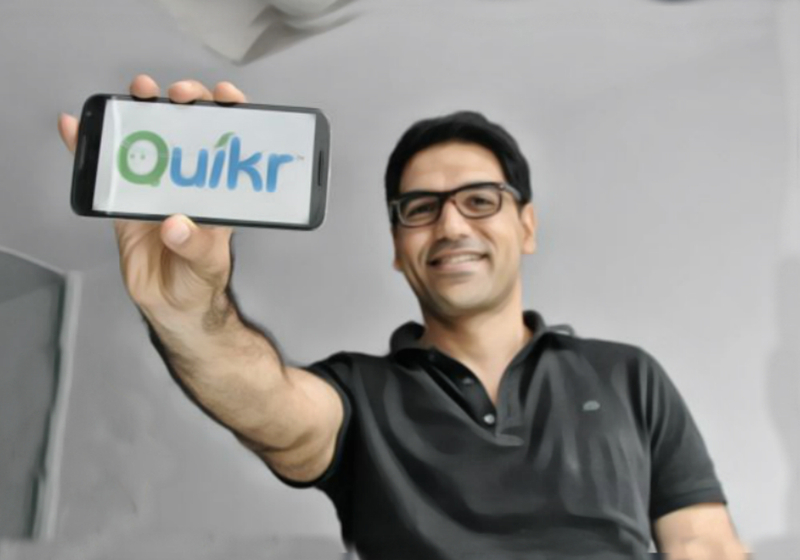 In August 2016, Quikr raised $19.4 Mn (INR 130 Cr) in a debt financing round led by Brand Capital, the private treaty arm of media company Bennett, Coleman and Co. Ltd (BCCL). In a bid to scale its beauty services brand AtHomeDiva, it also acquired on-demand beauty, wellness and fitness app ZapLuk.